4 bedroom detached house on outskirts of village with wonderful views down the valley towards Casola. Extremely well furnished with fully equipped kitchen and satellite TV (limited english channels). Lunigiana is the undiscovered area of Tuscany. where lush green valleys and mountains combine to create a magical atmosphere. Extremely well furnished property with spacious accommodation and all modern conveniences including TV/DVD in the lounge and 2 bedrooms. Adjacent to forested area with stream which is gently audible from terrace. Quiet location but easily accessible to coast, mountains (the Apuan Mountain National Park is approx 50Km away) and motorway network. Local railway station connects to major towns and cities. Sleeps 8. 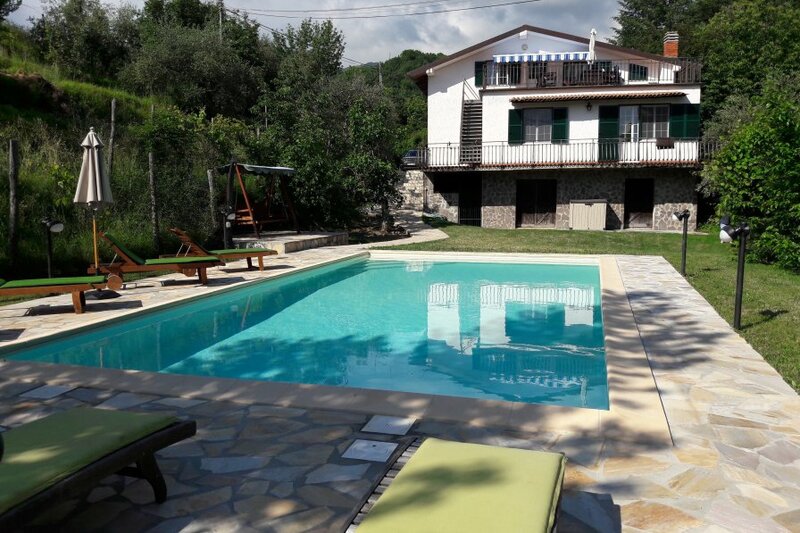 4 bedroom detached villa in private grounds. Breathtaking views. Quiet location but easily accessible to coast, mountains and motorway network. Vigneta itself has a bar (100m), while Casola (walkable but a 5 minute drive) has a bar, bank (with ATM), post office, mini supermarket and Petrol Pumps. The nearest main supermarket is about a 15 minute drive at Fivizzano, Pallerone, Grangola or Rometta. Local railway station connects to major towns and cities. A private swimming pool is available in the grounds of the house (see photo). The views from the terraces are delightful. From the mountains down the valley towards Casola. The coast is 40 minutes away and the motorway 20 minutes providing access to the whole region.